The whole ethos of Princess Mimi is to offer you vintage pieces that you can wear, knowing you'll not bump into someone wearing the same thing, but not necessarily attracting too much attention to yourself (HRH, of course, is a virtual recluse these days, and insists she never was one to grab the limelight anyway....) On those terms, this dress ticks all the boxes: it's sweet and simple, versatile and stylish, but demure and restrained at the same time...and, while we can't claim it's an exclusive, there certainly aren't many like this around any more! We've shown it with a tee shirt, but it would look equally good with a rollneck sweater or on its own....perfect for those days when it's not quite warm enough, but not really cold either! 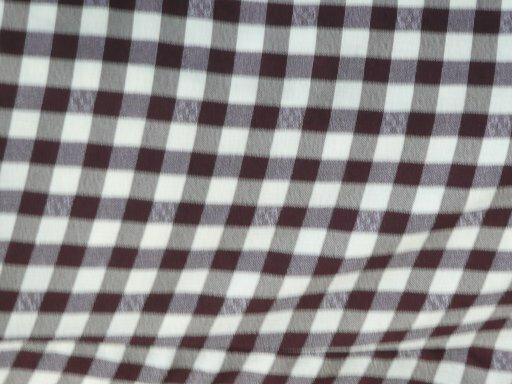 Made, I think, from a man made fabric, in a brown-and-white check that looks like gingham, it's slightly fitted and fastens at the back with a zip, with a little central slit at the back for ease of movement. It has the C&A label, but no washing instructions or size information, though I would say it would best fit a modern UK size 14-16; approximate measurements are: bust 40 ins/101.5 cms, waist 32 ins/81 cms, hips 42 ins/107 cms, length from back of neck 34 ½ ins/87.5 cms. And it's in perfect vintage condition!